Bhopal has been a stronghold for the Bharatiya Janata Party for several years now. On the other hand, Congress has not won from the Bhopal Lok Sabha constituency since 1989. In Lok Sabha election 2019, the contest is all set to be of titanic proportions between two candidates from the two political parties who are varyingly controversial. Congress had already named veteran party leader and former Madhya Pradesh CM Digvijaya Singh as its candidate from the Bhopal Lok Sabha constituency. Desperate to get back to winning ways here, the party had made the decision last month by the party’s Central Election Committee and was announced by current MP CM Kamal Nath. It is reported that Digvijaya was keen on fighting from his home turf of Rajgarh but was eventually given Bhopal to contest from because of Congress’ past performances here. Digvijaya can take some solace from the fact that while Bhopal has not been a happy hunting ground for his party in Lok Sabha elections, Congress had won three seats here in the Assembly election. Facing off against Digvijaya would be Sadhvi Pragya Singh Thakur who joined BJP on Wednesday and who has so far made news primarily for being an accused in the Malegaon blast of 2008. While there was some speculation that she would be chosen, many felt that BJP won’t make a gamble of epic proportions by eventually going with her. The party, however, did just that. Digvijaya welcomed Sadhvi Pragya as his opponent. “I wish her all the luck and pray to Ma Narmada that she blesses her,” he said. 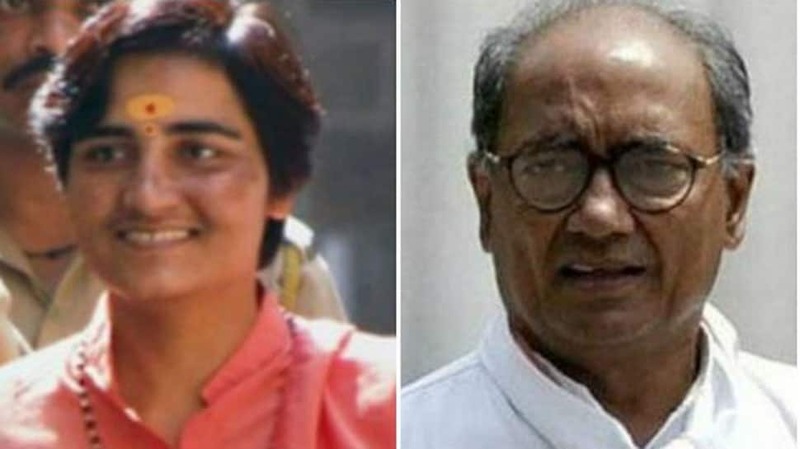 While Sadhvi Pragya may be elated at the opportunity of battling Digvijaya, her selection has raised many eyebrows because of the alleged connection to Malegaon blast. While charges against her under MCOCA have been dropped by an NIA court, Sadhvi Pragya continues to face other charges. In her defence, she maintains that it is because of a controversy that she had to spend six years in jail and in reality, people in Bhopal have been wanting to see her contest the election. Whether the people in Bhopal actually favour Sadhvi Pragya or will they put their trust in Digvijaya? The parliamentary constituency votes in the sixth phase – on May 12.